Can I Register For That? Your Honeymoon Registry. 23 May Can I Register For That? Your Honeymoon Registry. If there is one challenge that almost all engaged couples share, it’s where to come up with the funds to pay for their honeymoon. And while nine out of ten couples would love to ask for money for their honeymoon, finding a tactful way to ask for cash is hard! Fortunately this problem can now be a thing of the past, thanks to a honeymoon registry. Let’s face it… weddings can drain your bank account faster than you can say “I do”. Many couples have considered postponing their honeymoon because they just can’t see how they can afford it. Your honeymoon registry offers tactful way for you to ask for money from your wedding guests, and its fun for the guests too! Once you’ve nailed down the details of your dream honeymoon, your honeymoon planner can set up an account for the two of you. Your registry can be customized to your honeymoon destination with items like spa treatments, golf, zip lining, an upgraded room, etc. 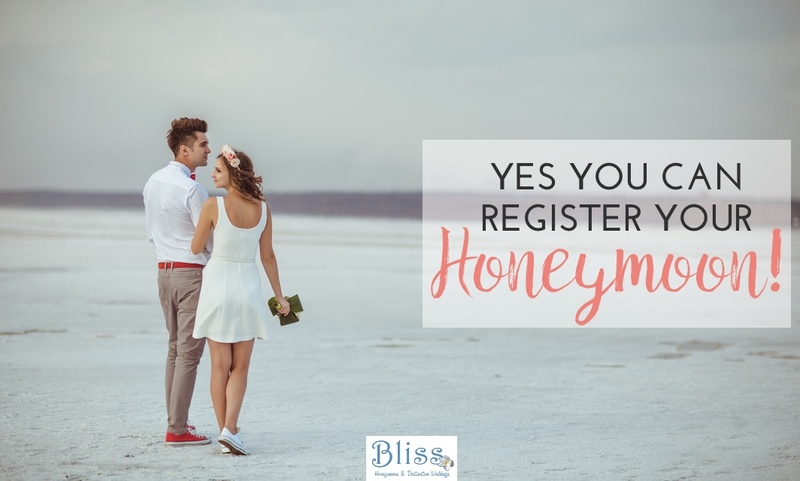 You’ll be provided with a link to your share with your family and friends, so they can easily jump online and make a contribution to your honeymoon registry. Your guests will love it because they can purchase a wonderful gift with just a few clicks of the mouse with no boxes to ship and nothing to gift wrap. They can even leave you a message telling you what they’ve purchased and offering their best wishes for your fun in the sun. The gifts in your registry are not physically purchased or set up. You’ll receive the gifts in the form of a check from the registry company. It’s secure, easy for you and your guests, and a sure-fire way to get you and your honey where you want to go. Let’s face it-we’ve all given gifts that we suspected to end up being re-gifted. Great honeymoon memories are always a welcome gift. Your guests will be honored to be a part of the memories that you’ll have for a lifetime. There are several ways to ensure your guest feel like a part of it all. Once you return post pictures of your trip and of the two of you enjoying some of the activities on you registry. Or, send postcard Thank You notes from your location. Unlike a gravy boat, a honeymoon gift creates memories you can share. Now that you know how you’re going to manage you honeymoon budget, check out our top 5 sexiest honeymoon locations.